; the atmosphere keeps the weather temperature around its normal ranges. Just to think how great this blessing is take the moon as an example; the temperature of one side of the moon is over one hundred degree while the other side is one hundred degree under zero. The nearest planet to the sun suffers the same problem. Most of the planets have no atmosphere or rather law atmosphere density and as a result they are a target of heavy meteors, destructive outburst of energy from the sun and radiations emitted from the sun and other stars. All the planets are pelted with meteors except the earth, only very few number, usually very small, penetrate the atmospheres which prevent the multitude from reaching the earth. However, if an object is big enough it can survive passage through the atmosphere. The damage done by a meteorite (an object that strikes the Earth) depends upon its initial size. 10--100 m: Objects in this size range can produce devastation similar to that of an atomic blast (leading to them occasionally being called "city- busters"). Effects include severe damage to or collapse of standing buildings and the ignition of flammable materials leading to widespread fires. The radius over which such effects occur would vary depending upon the size and composition of the object, but could easily exceed 10 km. The Tunguska event, in Siberia, of 1908 is thought to have been from an object about 60 m in size; it led to trees being flattened out to 20 km and trees 40 km away being damaged. At the small end of this size range, objects about 10 m strike the Earth about once a decade. Fortunately, only the densest objects, those containing iron, survive to the surface; most of the objects of this size explode sufficiently high in the atmosphere that there are no effects (other than maybe a loud noise) on the ground. At the larger end of this size range, it is estimated that the Earth is struck several times a millennium or about 1 impact every 100--200 yr. 100 m--1 km: Objects in this size range are likely to cause severe damage over a regional area, possibly as large as a continent (hence the name "continent-busters"). If they strike land, they will almost certainly produce a crater, while an ocean impact will generate large tidal waves. A 150 m object might produce a crater 3 km in diameter, an ejecta blanket 10 km in diameter, and a zone of destruction extending much farther out. For a 1 km impactor the zone of destruction might reasonably extend to cover countries. The death toll could be in the tens to hundreds of millions. A 1 km impactor could begin to have minor global consequences, including global cooling caused by vast amounts of dust in the atmosphere. Estimates from the geologic record suggest that craters are formed on the Earth roughly once every 5000 yr. 1--10 km: Objects in this size range are likely to cause severe global effects ("species-busters"). An impact 65 million years ago by an object of 5--10 km in diameter is thought to have been partially or fully responsible for the extinction of half the living species of animals and plants at the time, including the dinosaurs. The crater alone from such an impact will be 10--15 times larger than the object itself. World-wide crop failures from dust injected into the atmosphere could imperil civilization, and the largest-sized objects could make the human species extinct. The frequency with which the Earth is struck by such objects has to be estimated from the geological and paleontological record. At the low end of this size range, estimates are that such impacts occur roughly every 300 000 yr; at the upper end of the size range, impacts occur about every 10 million years. The atmosphere also prevents the fatal temperature of the universe (approximated to be 270 under zero) from reaching the earth. The energy released in a Sun burst is so powerful that the human mind would hardly comprehend it: A single burst is equivalent to 100 billion atomic bombs similar to the one dropped on Hiroshima. 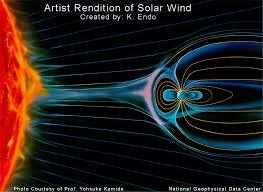 The world is protected from the destructive effects of this energy by the atmosphere and the Van Allen Belts. The magnetosphere layer, formed by the magnetic field of the Earth, serves as a shield protecting the earth from celestial bodies, harmful cosmic rays and particles. These belts at thousands of kilometres above the earth protect the living things on the Earth from the fatal energy that would otherwise reach it from space. The Holy Quran more than one thousand and four hundred year before scince could prove these startling facts refers to this fact. We made the sky a preserved and protected roof yet still they turn away from Our Signs.."